Robert Reid (III) taught his son James piping and pipemaking, and taught his youngest daughter Elizabeth to play pipes. It is not known whether any of the other Reid children played pipes. JAMES REID, 1814-1874, according to the inscription on his grave headstone, was born on 20th January 1814, but no documentary record of his birth has yet been found. He was nearly 23 when his father died, and it is presumed that he had been taught pipemaking by his father. James also played violin and in the 1841 census at the age of 27, he described himself as a Music Master. On census day, June 7th 1841, the Dortwick Street household consisted of his mother, Isabella, and a young woman of 23 called Elizabeth Johnson. At any time during James’s adult life there were another two or three professional Music Masters, i.e. music “professors” or teachers, living and working in North Shields. Perhaps he could not complete, because the 1841 record was the only such census entry and in the 1851 census (30th March 1851) and after 1855 he did not again describe himself as a teacher. On January 13th 1851, the fourteenth anniversary of his father’s death, James married Ann Todd. The marriage certificate identifies James’s profession as Musical Instrument Maker and his father as a Musician. No profession is given for Ann, and she signed the register with her mark. Her father Robert Todd is described as a waggonman, which might mean either that he was a waggoner, carter or haulier of some sort, or that he worked leading coal waggons (chaldron waggons) on the extensive complex of waggonways (early railways) carrying coals from numerous collieries to shipping points on the River Tyne just west of North Shields. In March 1851 James and Ann were living in Dortwick Street, probably still in the old Reid family home, in which they are the only occupants listed. Within a year or so they had moved to a new home away from the industrial dockside slum to one of the clean, ‘modern’ dwellings with a water supply, situated in Linskill Street, built after 1827 in “new” part of North Shields above the riverbank. It is perhaps ironic that in these advertisements James lists the sort of mass-produced instruments that were already sufficiently popular, and cheap enough, to displace the more complex, craftsman-made small-pipes. The Anglo-German concertina emerged in its earliest form during the 1830s, and the English concertina had been patented by Wheatstone only in 1844, but was already very popular. The earliest form of accordion was invented in Vienna in the 1830s and its subsequent development and spread was rapid. The reference in the advertisment to repairing umbrellas is significant, in that it may be the genesis of the wide-spread legend that Robert Reid (III) was an umbrella maker. Robert was recorded as a musician in parish registers, and this must have been his own description of his primary occupation and would therefore reflect his sense of identity. Although it is possible that Robert may indeed have done some sort of “out-working” for a well-established umbrella manufacturer in North Shields, there is no documentary or contemporary evidence to confirm that. James, however, seems to have repaired umbrellas until the end of his life, as Charles Keene specifically mentions it in a letter of c.1874 to Joseph Crawhall. James and Ann lived in three different addresses in Linskill Street over the next 23 years, until he died and Ann moved to live with relatives nearby. Over this quarter of a century James maintained his business making and maintaining musical instruments (there is no evidence that he made anything other than smallpipes, and very few sets demonstrably made by him alone can be identified), and as a seller of other musical instruments, toys (in the sense of novelties), and intermittently advertised himself as a maker and repairer of umbrellas and parasols. A letter James wote to William Kell in on 7th December 1857 confirms that was actively dealing in pipes or pipes maintenance, because he charged Mr Kell £1 “for the pipes” and was paid by postal order. From 1858 Ann appears in her own right in various directories running a Domestic Servants Registry. She continued this business after James’s death. An anomaly seems to exist between this and the fact that she signed the marriage register with her mark. No example of her literacy skills is known, but it is hard to imagine that she ran a registry or agency without functional literacy. In 1858 James again wrote to Mr Kell asking to be considered for the post of one of the Duke’s pipers. He was duly appointed as deputy to William Thomas Green. The nature and duration of his work remain obscure, especially so as it is known that William Thomas Green himself played to open Tynemouth and North Shields fairs. “I gave a set to a friend of mine, a Scot in Edinburgh, nearly a year ago, but sent them en route to old Reid, to put some metal reeds in the drones, and there they are stuck! ….. If you are near his shop it’s worth visiting. I like the old boy very much, so don’t scold him, but tell him I can’t get on for want of an easy-going chanter reed. He’s always mending those confounded umbrellas; that’s the worst of your pluvial country. I often jog him with a letter, but he never answers. He has a set of Low-country pipes of his father’s make. I asked him if he would part with them the last time I wrote. This description is worth noting; the only known piper who was also a shoemaker is Robert Nicholson but he died in 1842, long before Keene took up piping, and there is no evidence that he ever visited London. Another possibility, though, is J W Fenwick, if it is accepted that Keene was unsure about the piper’s occupation and may have remembered it incorrectly. James Reid’s friend may have been J W Fenwick; he lived in Newcastle during the time that Keene was a piper, a tailor might be expected to dress neatly to advertise his skill, and the evidence of the Fenwick Collection strongly suggests that he prepared tutorial materials by the 1870s. Further, biographical research strongly suggests that James Fenwick had known James Reid since the 1840s at the latest, and possibly for years before that. There is, however, no corroborating evidence that Fenwick visited London. Keene appears not to have been the only person to find James dilatory, especially towards the end of his life. 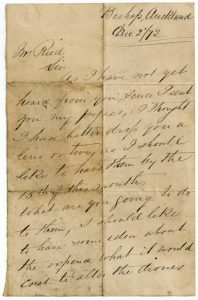 A piper in Bishop Auckland, James Ellis, wrote to James Reid in December 1872, seeking information and to hasten the return of his pipes. The letter shows that James was at that time still doing significant work as a pipe-maker, as Ellis was also enquiring about a drone switch which would allow a rapid change of key between pre-tunes drones without having to re-tune individual drones. It is not known whether Ellis’s slightly anxious letter had the desired effect on either James’s pace of work or his willingness actually to communicate with his clients. ELIZABETH OLIVER, née REID (1818-1890s) was taught piping in her youth by her father – she was only 18 when he died. Nothing is known with any certainty about her life before her marriage. In the 1841 census the Reid (spelled Reed) household in Dortwick Street – defined in the census by the enumerator’s check-marks – accommodates three people, Isabella Reed, wife of Robert (III) and described as of independent means, James, and an Elizabeth Johnson, aged 23, a straw-hat maker. This woman would have been the same age as Elizabeth Reid, but may have been a lodger. If it is Isabella’s daughter, then she must have been married (legally or in common law) and living in or visiting the family home on census day, but subsequently been separated or widowed prior to her later marriage of 1853, and reverted to her maiden name because she was married in 1853 as Elizabeth Reid. In the 1851 census James’s sister is not shown at Dortwick Street. She may have been the Elizabeth Reed of North Shields who is listed in the 1851 census as visiting people in Chirton on census day (then a village on the western edge of North Shields, a mile or so from Dortwick Street). In 1853 in Merthyr Tidfil Elizabeth married John Oliver of Tynemouth and moved with him to Neath in south Wales. He was a colliery viewer, and may have been the man (or the son of the man – both father and son were viewers, and called John) who worked as a colliery viewer at Percy Main colliery in 1845 and who is listed as a shareholder in the Stockton & Durham County Banking Company. In 1883 she sent tunes to James Fenwick together with comments on their sources. These included “The Dorrington Lads” as played by Robert Reid and “Maggie Lauder with Var.s” as she learned it from her father. They make it clear that she was a competent piper in her own right, and that she had been taught to play by her father, Robert (III). The notation of “Maggie Lauder” is on a page of blue paper pasted into the Fenwick Collection, and has the annotation, “Mrs Oliver’s copy”; if this indeed in her own hand, then her music notation was practised, detailed and used accurate syntax. The whereabouts of her manuscript collections, if indeed they still exist, are not known. Follow this link to the page about the Reid family repertoire.